WILMINGTON (WTVD) -- The Coast Guard rescued five people from the water eight miles off Topsail Island on Sunday. Around 9:50 a.m., authorities responded to a call that a 19-foot boat was taking on water with five people aboard. 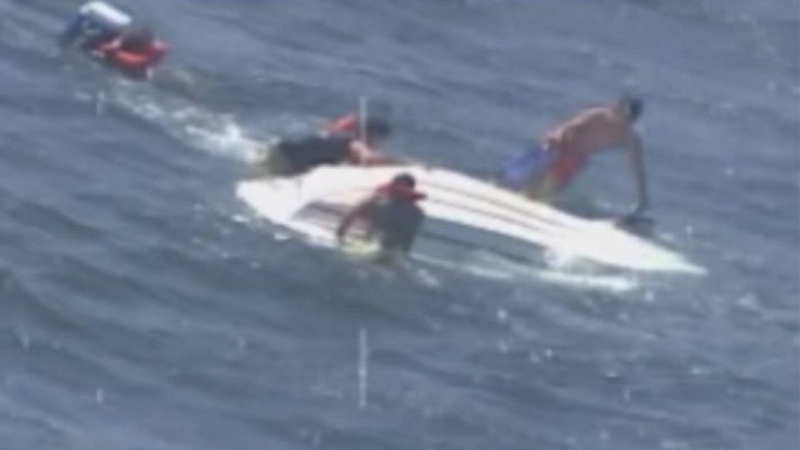 Three of the people were wearing life jackets; two were sitting on the capsized boat's hull. An already-airborne HC-130 Hercules airplane crew from Air Station Elizabeth City diverted to the area and two boat crews from Station Wrightsville Beach also responded to the area around 10:00 a.m. When the Hercules crew arrived, they dropped rescue gear and a flare to mark the vessel's position. Then the RB-S crew pulled all five people from the water and transferred them back to the station. "This is a perfect example of how vital it is to not only make sure you have life jackets on board but also that they are readily available in case of an emergency," said Stephen Sawyer, Sector North Carolina command duty officer for the case. "This situation also illustrates how important it is to work closely with our local partners. Pender County 911 relayed critical information to us about the vessel's position that helped us reach the people quickly."